necessary to show the star ship landing on a planet. Science-fiction has always been an inspiration to scientists, as well as to lay people. Television's greatest science-fiction franchise marks an important milestone this evening. The world premiere of Star Trek, at the beginning of the 1966-1967 television season, occurred precisely 50 years ago (from the time of the posting of this blog post), at 7:30 p.m. Eastern Daylight Saving Time (EDT) / 23:30 Coordinated Universal Time (UTC) on Tuesday Evening, 1966 September 6. Star Trek was originally produced for America's NBC Television Network. However, due to the varying schedules of the several world television networks slated to air Star Trek, the world premiere actually occurred on the CTV Television Network in Canada. Coincidentally, the lead television actor on the series, William Shatner (who portrayed Captain James T. Kirk of the U.S.S. Enterprise), was born in Montreal, Quebec, Canada. The United States premiere of Star Trek occurred two days later, on Thursday Evening, 1966 September 8 at 8:30 p.m. EDT / September 9, 0:30 UTC, on NBC-TV. The CBS Television Network had considered Star Trek for the 1965-1966 television season, but instead picked-up the science-fiction program Lost in Space, which ran from 1965 to 1968. The original Star Trek series, which portrayed the missions of a Star Fleet crew on the interstellar Star Ship Enterprise circa A.D. 2260, only lasted three seasons. However, unlike most other television series Star Trek had just begun. When episodes from the first three seasons started being broadcast in reruns, syndicated to television stations across the country, the program started to build a new and bigger following, than during the prime-time airings of the show. This was particularly true for children, who would watch Star Trek every weekday after coming home from school. This new popularity brought-forth an animated Star Trek series for children, on NBC-TV. Four more Star Trek series, Star Trek: The Next Generation, Star Trek: Deep Space Nine, Star Trek: Voyager, and Star Trek: Enterprise followed beginning in the 1980s. Except for Star Trek: Voyager and Star Trek: Enterprise which were both broadcast on the new UPN-TV network, the other two Star Trek series were not broadcast on any television network; episodes of these series were syndicated, first-run, to individual television stations across the country. Star Trek: Voyager, touted as the “show that started a. network,” was the signature show of the then-new UPN Television Network, which later merged with the WB Television Network to form the present CW Television Network (which is owned by CBS). CBS plans a new Star Trek: Discovery series for next year, to be aired on their premium, Internet streaming service, CBS All-Access. Additionally, six full-length Star Trek motion pictures were produced, using the cast of the original Stat Trek television series. The cast of Star Trek: The Next Generation starred in four additional films. Additionally, three more films were recently made on the basis of the original Star Trek television series, but with a new, younger cast. The original Star Trek series began during the middle of the “Space Race,” to the Moon between the United States of America and the Union of Soviet Socialist Republics (now known as the Russian Federation). Astronomy and Space Sciences were very important during this time period of American history and was emphasized in the schools, similar to the STEM (science, technology, engineering, and mathematics) emphasis in the schools today. This was due to the surprise of Russia launching the first man-made satellite, Sputnik 1, into Earth orbit on 1957 October 4. In fact, Pittsburgh's original Buhl Planetarium and Institute of Popular Science was one of many science institutions across the country which participated in one of the earliest citizen-science programs, Operation Moonwatch, which asked amateur astronomers and other interested citizens to help track Sputnik and other satellites later launched by the United States and the Soviet Union. 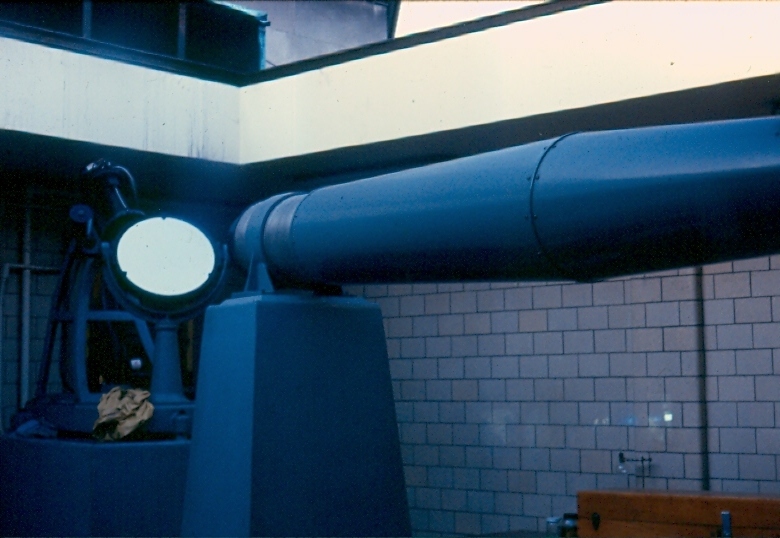 Operation Moonwatch had been organized by the Smithsonian Astrophysical Observatory for the International Geophysical Year (IGY – 1957 to 1958), the year-and-a-half period of time specified for international scientific research and collaboration. Although the United States had planned to launch the first satellite during the IGY, American space officials were shocked when the Soviet Union up-staged them with the Sputnik launch. Of course, this had national defense implications, particularly occurring near the beginning of the Cold War between America and Russia. If Russia had the technology to orbit an Earth satellite, it also had the technology to launch intercontinental ballistic missiles, potentially carrying nuclear warheads, toward the United States. It was in the Cold War and Space Race eras that Star Trek started its “Five-Year Mission.” Although, initially, Star Trek was a popular television program, this popularity did not last. Unfortunately, even today, people interested in science and space exploration, and hence become an audience for a science-fiction series such as Star Trek, is a minority of the nation's population. In addition to promoting space exploration during the Space Race days of the mid-1960s, Star Trek gave a very optimistic view of the future, including a U.S.S Enterprise crew which included all races, as well as humanoid species from other planets. This was very welcome to many television viewers during the turbulent 1960s, when the newspapers and radio and television news broadcasts highlighted racial tensions and the continuing Vietnam War. This optimism for a better future was very appealing to many Americans. And, Star Trek seemed like a future that could really happen. Unlike many previous science-fiction motion pictures and television programs, Star Trek used scientific advisers to make the science-fiction seem as realistic as possible. Star Trek, from the very beginning, had insisted on being as scientifically plausible as possible, even though it was a science-fiction series that did take a few liberties in the science to have an entertaining, action-adventure series. The program's actors and staff toured NASA facilities, to get an idea of the future of space exploration. For several of the Star Trek series --- The Next Generation (during the seventh and last season, also for two of The Next Generation motion pictures), Deep Space Nine, Voyager, and Enterprise --- American television producer and screenwriter Andre Bormanis (who has a degree in physics from the University of Arizona, as well as a master's degree in science, technology and public policy from George Washington University) was a credited Science Consultant. Naren Shankar (who has B.S., M.S. and Ph.D degrees in applied physics and electrical engineering from Cornell University) was the credited Science Consultant during the sixth season of The Next Generation and the first season of Deep Space Nine. I do not know of any other science-fiction series that has had a Science Consultant listed in the program's credits. An interesting result in this careful attention to scientific detail, when designing the program and the Star Ship Enterprise, was that several of the technical devices used on the ship, predicted in 1966, are reality today. Of course, the Star Trek communicator is quite similar to cellular telephones in use today. Desk-top computers, found throughout the Enterprise, are now found throughout offices and homes. And, when Captain Kirk once kidded Engineer Scotty about constantly reading his technical journals, those technical journals were being read on a desk-top computer, as many scientists and engineers today do the same thing. But, up until this time, most science-fiction television programs had been broadcast in black-and-white (i.e. monochrome). Even though most people at this time did not own a color television, could you really display Star Trek as a futuristic show with cutting-edge technology, while it is broadcast in black-and-white? By 1965, all three American commercial television networks were in the process of converting their programming, particularly during evening prime-time [which originally was 7:30 to 11:00 p.m., but later shifted to 8:00 to 11:00 p.m., due to new Federal Communications Commission (FCC) regulations], to color broadcasting from the monochrome or black-and-white transmissions that had been typical since the beginning of commercial television broadcasting in 1941. In 1965, CBS, which now owns the Star Trek franchise, broadcast the first season of Lost in Space in black-and-white, while the last two seasons were broadcast in color. However, all three seasons of the original Star Trek program (and of course, ultimately, all seasons of all Star Trek spin-offs) were broadcast in color. NBC was then owned by RCA (Radio Corporation of America), which was the largest producer of color televisions. So, to help RCA sell more color television sets, NBC pioneered color broadcasting ahead of the other two networks. Up until 1966, usually, a new program on NBC would be broadcast in black-and-white for one year; if the program was popular enough to be renewed for a second year, it would automatically convert to a color broadcast. In fact, during the 1965-1966 television season, NBC only broadcast two new programs in black-and-white, while all other programs were broadcast in color. Then, at the beginning of the 1966-1967 television season, NBC-TV declared themselves the “Full-Color Network.” From then on, all NBC programs were broadcast in color. The other two commercial networks soon did likewise. However, Star Trek did not seem to follow the normal NBC rules. Even Star Trek's very first pilot episode, filmed in 1964, was in color. It may be that they felt a futuristic, science-fiction program should be in color. But, the question remains, if CBS had picked-up Star Trek in 1965, instead of Lost in Space, would the first season have been in color? Star Trek was not the only science-fiction television series to premiere during the 1966-1967 television season. A day after the American premiere of Star Trek, The Time Tunnel premiered on the ABC Television Network, on Friday Evening, 1966 September 9 at 8:00 p.m. EDT / September 10 at 0:00 UTC. In The Time Tunnel, also telecast in color, at a secret American installation a time machine known as the Time Tunnel was constructed. Two scientists transported through the Time Tunnel and appeared in a different time and place, often close to an event in world history, during each of the 30 episodes of the one and only season of the program. Although ratings for the program were relatively good, and it was expected to be renewed for a second season, an ABC executive lobbied for The Time Tunnel to be replaced by a new program called The Legend of Custer. After poor ratings and poor media reviews of The Legend of Custer, it was canceled after 17 episodes. The Time Tunnel never returned to the ABC schedule. Star Trek also included several time-travel episodes. One episode (the last episode of the second season, originally aired Friday Evening, 1968 March 29), was even a pilot for a possible spin-off program: Assignment: Earth. However, this proposed spin-off was not picked-up by NBC for a separate program. At the beginning of the “Assignment: Earth” episode of Star Trek, the U.S.S. Enterprise travels back in time to 1968, to conduct “historical research” regarding how Earth avoided a nuclear holocaust during the mid-1960s. It is curious that no history professors, specializing in 20th century Earth history, accompanied the Enterprise crew on this historical research mission! Soon after arriving in Earth orbit in 1968, a mysterious man in a 20th century business suit is intercepted by the Enterprise's transporter, having teleported from a thousand light-years away. Known as Gary Seven, he claims to be a human, who grew-up on an alien planet, specifically on a mission to come back to Earth and help Earth survive a world with nuclear weapons. During a briefing in an Enterprise conference room, Mr. Spock mentions that current crises (at that time in 1968) could fill a “tape bank.” He says, "There will be an important assassination today...” This episode, the last episode of season 2, aired on 1968 March 29. A few days later, on 1968 April 4. Martin Luther King, Jr. was assassinated in Memphis, followed by riots in many U.S. cities. Mr. Spock continues, during the briefing, saying, “...and, this could be highly critical, the launching of an orbital nuclear warhead platform by the United States, countering a similar launch by other powers." As the major plot of this episode, Gary Seven's goal was to take-over the U.S.'s orbiting nuclear warhead platform, and cause it to almost set-off World War III. It was Gary Seven's hope that this would scare all of the major powers to give-up orbiting nuclear warhead platforms. In reality, the Outer Space Treaty, which took effect about a half-year earlier (1967 October 10), forbade any nation signatory to the treaty from placing weapons of mass destruction into Earth orbit. This treaty had been opened for signature, on 1967 January 27, in the capitals of three countries: United States, United Kingdom, and Russia (then known as the Union of Soviet Socialist Republics); by a tragic coincidence, the late afternoon of that same day, U.S. astronauts Gus Grissom, Ed White, and Roger Chaffee were killed in a fire during a test of their Apollo 1 space capsule. The “Assignment: Earth” episode script may-well have been substantially written before the treaty went into effect, and Star Trek creator Gene Roddenberry may have decided to go-ahead with the episode. Early in the episode, Gary Seven, who had escaped from detention on the Enterprise and was now in a private office in New York City, was trying to, verbally, get information from his large office computer, but the computer refused to give him any information without proper authentication. Finally, Gary Seven explained his mission to the computer saying, "Problem: Earth technology and science have progressed faster than political and social knowledge. Purpose of mission: To prevent Earth's civilization from destroying itself, before it can mature into a peaceful society." My father, William L. Walsh, who was a Senior Research Chemist for the Gulf Oil Corporation (but had such an interest in history and public affairs, that he almost became a history professor), impressed upon me, as we watched this episode together, the importance of the first sentence of this particular statement. That we may have developed great technology (and, our technology in 2016 is much greater than it was in 1968), but the peoples of the world must learn to live together or the technology could destroy us. Star Trek creator Gene Roddenberry often placed important social messages, such as this one, into episodes of Star Trek. Day, Dwayne A. "Boldly inspiring no more." The Space Review 2014 Nov. 24. Regarding the first (1964) television pilot of Star Trek, and how its influence in inspiring the Space Program may be fading. Cho, Adrian. "Big step for quantum teleportation won't bring us any closer to Star Trek. Here's why." Science Magazine 2016 Sept. 19. Heller, Karen. "This 'Star Trek'-inspired gizmo could win its inventors $9 million." The Washington Post 2017 March 21. Regarding an XPrize for development of a real medical tricorder. "Star Trek 'Universal Translator' Realized by Microsoft." 2012 Nov. 11. "Star Trek Tricorder Becoming Reality." 2012 March 30. "Star Trek's 'Universal Translator' Becomes Reality." 2012 March 19. Well put together article . Trek was a first love, something that opened up the possibilities of "If..." in my mind. It helped to put me on my path. I'm not sure I can ever go back to any other place, after an experience like this. The Los Angeles event venues are appropriate in a space that lends so much gravitas to events. The design is sharp and environment is unbelievably good.